The Danvers Archival Center is a department of the Peabody Institute Library of Danvers, Massachusetts. The Peabody Institute Library is the town's public library, established in the mid-nineteenth century through the philanthropy of George Peabody. Conceived in 1970 as part of the Danvers Historical Commission Master Plan, the purpose of the Archival Center is to collect and place in one central location, protected from fire, atmospheric, and insect damage, all the written and printed materials relating to the history of Danvers and Salem Village, Massachusetts. The significance of the Archival Center rests with the fact that it was the first of its kind to bring together such a large collection of public and private records of a single community for purposes of preservation and accessibility to researchers. The archives houses probably the most extensive and varied collection of materials relating to an individual municipality in New England. The collections on permanent deposit include the local history holdings of the Danvers Historical Society, the library, numerous churches and town organizations, and official records of the Town of Danvers. The Archival Center collects through gifts, purchase, and in cases where the material belongs to still-functioning corporate organizations, permanent deposit materials on paper relating to the history and development of Salem Village and Danvers, Massachusetts. Items collected include books, pamphlets, monographs, manuscripts, periodicals, maps, photographs, newspapers, audio and video tapes, films, broadsides, microforms, and architectural drawings. 1. PRINTED MATERIALS ON LOCAL HISTORY. 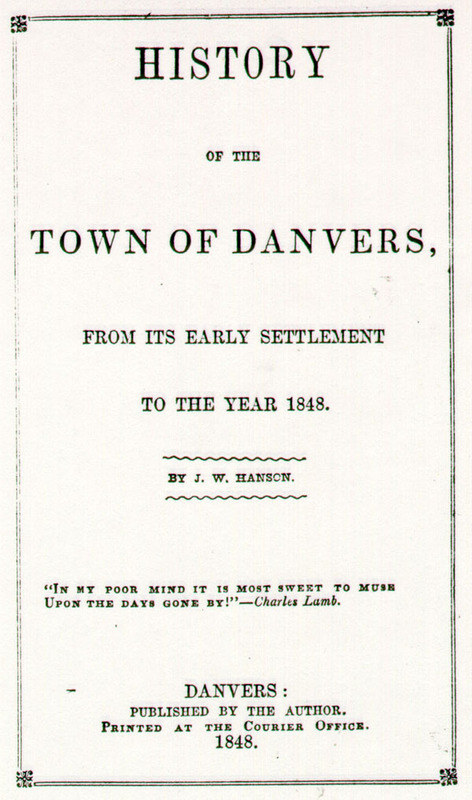 Included in this segment of the collections is printed material relating to the Town of Danvers, from general histories of Essex County and Danvers to volumes devoted to specialized topics such as the Danvers Historical Society Collections from 1913. There are complete runs of the Statements of Accounts of Danvers from 1845, Valuations of Danvers from 1856, Danvers School Reports from 1839, Street Poll Lists from 1890, and numerous biographies of Danvers notables, including Israel Putnam, John Greenleaf Whittier, Samuel Parris, John Endecott, Samuel Holten, George Peabody, and Grenville Dodge. Augmenting the printed collection are general reference sets important to local study, including Acts and Resolves of the Province of Mass. Bay; Journals of the House of Representatives of Massachusetts; Essex County Quarterly Court Records and Files, 1636-1686; and the Essex Institute Historical Collections from 1859. 2. GENEALOGY. 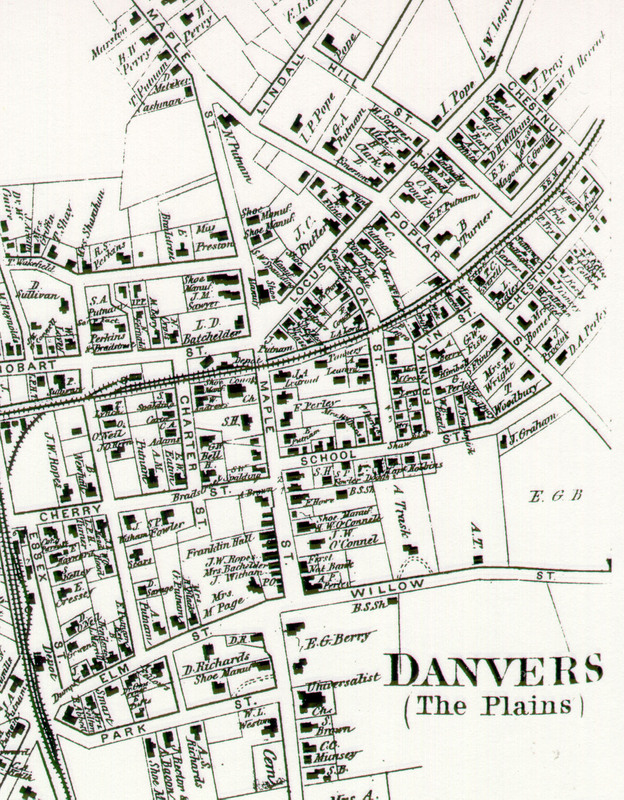 While the Archival Center does not attempt to gather an all encompassing collection of family histories, it does endeavor to acquire genealogies of important Danvers families, including the Putnam and Porter families. Reference volumes for genealogy include vital records to 1850 of most Massachusetts towns and of Massachusetts soldiers and sailors in the Revolution, War of 1812, and Civil War, The Essex Antiquarian, and many volumes of the New England Historical and Genealogical Register. 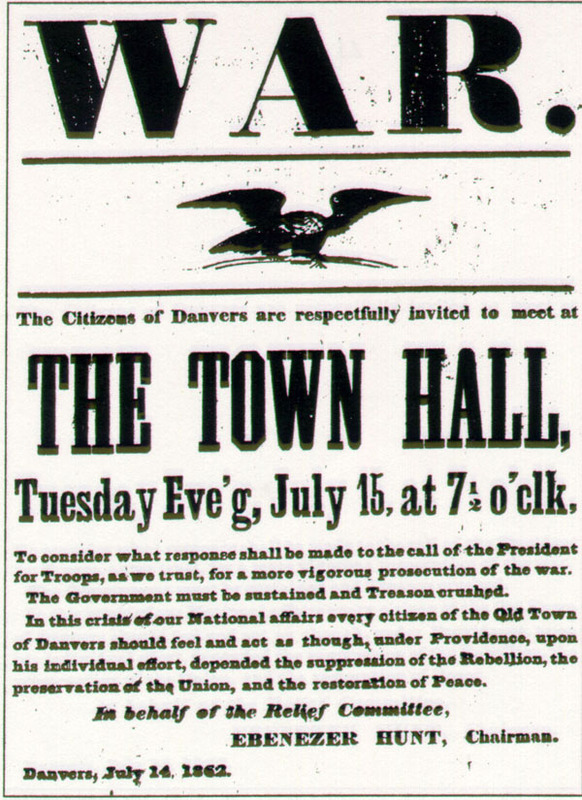 Also of aid to the genealogical researcher are the town manuscript vital records dating up to about 1917 and federal census records for Danvers from 1790 to 1910. 3. WITCHCRAFT. The Ellerton J. Brehaut Witchcraft Collection is perhaps the most complete collection of printed materials relating to the 1692 witchcraft hysteria in Salem Village (present day Danvers). Included in this collection are well over 1,000 items. The collection includes originals or copies of all the early imprints relating to Salem Village witchcraft, as well as a number of seventeenth-century English volumes on the subject. Early volumes include C. Mather's 1693 Wonders of the Invisible World, Calef's 1700 More Wonders, Hale's 1702 Modest Inquiry, Lawson's Brief and True Narrative, I. Mather's Cases of Conscience, Upham's 1834 Lectures and 1867 Salem Witchcraft, Woodward's 1864 Records, and many of the books that were owned and used by witchcraft scholars. Documents include the only signature mark of Giles Cory, and within the collection is the three-volume typescript copy set Salem Witchcraft, containing the verbatim transcription of the witchcraft papers constituting the most complete source in existence of the hysteria. Also augmenting the collection are the manuscript records of the First Church of Danvers, Congregational dating from 1689. 4. MANUSCRIPT COLLECTIONS. Among the 500 volumes and 75,000 manuscript Town Records are the Salem Village Records of Transactions (1672-1715), town meeting, tax, and valuation records from 1752, and the vital, fire, school, selectmen, military, town clerk, town treasurer, overseer of the poor, police, electric light, library, assessors, and street records. 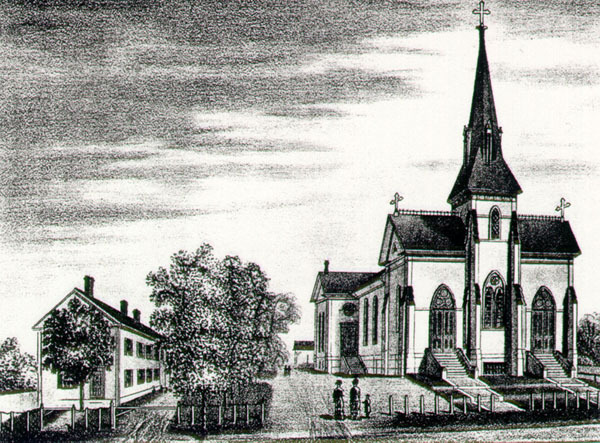 Non-municipal records include account books, daybooks, journals and diaries, deeds, wills, and inventories, from as early as the seventeenth century; records of numerous organizations, including the First Church, Maple Street Church, Baptist Church, Universalist Church, Methodist Church, Episcopal Church, and Danvers Historical Society; collections of correspondence, and a great variety of other manuscript materials. HOURS: The Archival Center is generally open to the public Monday 1:00-7:30 p.m.; Wednesday & Thursday 9:00 a.m.-12:00 p.m. and 1:00 p.m.-5:00 p.m.; the 2nd & 4th Friday 1:00-5:00 p.m.; and the 1st Saturday 9:00 a.m.-12:00 p.m. and 1:00 p.m.-5:00 p.m.. Due to scheduling and limited staff, persons traveling any distance to use the Archives should call ahead and speak to the Archivist to assure that the Center will be open for visitation. There is no visitation charge for use of the Archival Center.